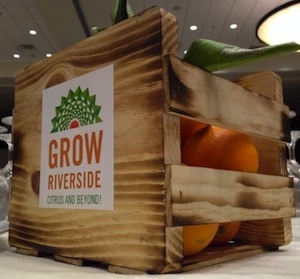 Riverside, CA — January 14, 2015 — Seedstock, in partnership with the City of Riverside, today announced it once again will present the “Grow Riverside” conference slated for June 11-13, 2015. This year’s conference at the Riverside Convention Center sets its focus on “The Future of Local Food” with the goal of sharing vital lessons and information with many municipalities. Using Riverside’s significant accomplishments over the past 12 months as a model, the conference will examine the City’s initial steps to build and strengthen its local food system as well as explore solutions to help other cities and local governments establish and bolster their own similar initiatives. “The need to establish local, sustainable food sources continues to be one of our society’s greatest challenges, and it is a privilege to assist the City of Riverside in meeting that challenge,” said Seedstock co-founder and Grow Riverside event organizer Robert Puro. “This conference provides the opportunity for growers, entrepreneurs, policy makers, investors, residents, career changers, and students – anyone with an interest in exploring solutions to sustainably increase local food in cities and their environs – to come together to identify the economic and community advantages of local sustainable farming,” he said. Keynote addresses and panel discussions will afford conference attendees the opportunity to explore a variety of topics, including: Marketing Local Agriculture; Growing New Farmers and Entrepreneurs; Growing Opportunities and Ag Innovations in the Greenbelt and Beyond; Water Policy and Usage; and, Local Food Health Impact. Additionally, a series of local symposiums on sustainability, along with community farm-to-table dinners, will be presented throughout the next few months leading up to the conference in June. The City of Riverside made the navel orange a symbol of bounty and a household staple in California. Today the City maintains more than 1,000 acres of citrus groves. As Riverside continues to grow, so does local pride for the City’s rich agricultural history and consumer demand for healthful local foods. A full 11 percent of the city’s total acreage is designated for agricultural use, unparalleled for a Southern California city of its size. Riverside’s growers, local government officials, and residents are at the forefront of innovation as a city devoted to sustainable local agriculture.